Vought F4U Corsair World War 2 Military Model Airplanes and Airplane Kit. Plastic Model Kits, Wood Airplane Models and Die Cast Models. F4U Corsair World War 2 Propeller Fighter Aircraft. Diecast models, plastic scale model kits, balsa wood models and mahogany display models. These F4U airplane kits are very detailed and show a big part of military aviation history. 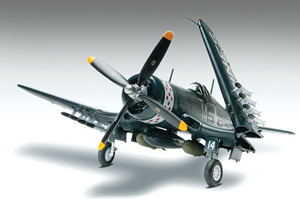 World War 2 Warbirds, F4U Corsair Models, plastic model kits, wood models, and die cast model airplanes. Vought F4U Corsair 2 Guerra Mundial modelos de aviones militares y kit de avion. Used by the famous Black Sheep Squadron, these model airplanes of the F4U Corsair are great for teaching about aviation history, blueprint reading, assembly techniques, and just having fun. I put all of the plans that come from my models in a 3 Ring, view binder. This makes a great collection of all of your plans. This F-4U Corsair could be your first set of plans in your collection. The Vought F4U Corsair was used in the military by both the Navy and Marines. The F4U Corsair is a radial engine fighter known for both its bent wings and its unique sound. The F4U Corsair was 33' 4" long, 16' 1" high and had a wingspan of 41'. The F4U Corsair had an empty weight of 8,982 lbs and a gross weight of 14,000 lbs. The F4U Corsair used one Pratt & Whitney R-2800 engine which produced 2200 - 2300 hp. The F4U Corsair had a cruise speed of 182 mph, a max speed of 417 mph and a max climb rate of 2,890 ft/min. The F4U Corsairs maximum range was 1,015 miles. This airplane was mostly a carrier based airplane however it was also used from land based runways in the pacific by now well known pilots like Pappy Boyington of the Black Sheep Squadron. Webmasters Note: The specs on this page are only for one variation of this plane. There are many other variations that have different specs. This top-of-the-line 1/32 scale plastic kit features a completely outfitted cockpit with an optional-position canopy; a full armament package of bombs and rockets; movable control surfaces; a clear cowling to show off the supremely detailed 18-cylinder engine; metal detail parts; a choice of 21-victory ace Ken Walsh's VMF-222 markings from Okinawa, 1945, or those of VMF-323, the Death Rattlers, from the Korean War; and more. 15" wingspan; 350 parts, assembly required. Meticulously hand carved and painted by expert craftsmen, this premium quality, 1/40 scale, mahogany model of an F4U-4 Corsair flown by the VMF-214 "Black Sheep" - the first Marines squadron to see action in Korea - is a real beauty! It even includes 1/20 scale models of an AN-M65 1,000-pound bomb, an AN-M64 500-pound bomb and a High Velocity Aircraft Rocket (HVAR) along with a metal history plate mounted on the elegant wood display base. 12" wingspan. Thompson. Through firsthand accounts, full-color profiles and many never-before-published photographs, this book examines the operations of the 26 U.S. Navy Squadrons - most of which were carrier based - and the six Marine Corps squadrons that flew F4U Corsair combat missions during the Korean War. 96 pages, 75 color and B&W photographs, 33 color profiles, 7"x 9", softcover. a bent-wing F4U-1D flown by VMF-112 in 1945, this 1/72 scale, die cast model features engraved panel lines, a detailed cockpit with a glazed canopy and a pilot figure, removable gun access panels, a rotating propeller, two drop tanks, optional position landing gear, authentic markings, a clear plastic display stand, and more. 6" wingspan. "White 29," the famous F4U Corsair flown by Ira Kepford (the U.S. Navy's most successful Corsair pilot with 16 confirmed victories) of the VF-17 "Jolly Rogers," this 1/72 scale, die cast model features engraved panel lines, a detailed cockpit with a glazed canopy, a realistic engine front with a rotating propeller, optional-position landing gear, and authentic markings, including victory symbols below the canopy and the squadron's skull-and-crossbones insignia on the engine cowl. 6" wingspan; includes a display stand. The eighth release in the Oxford Diecast series of 1/72 scale, die cast warplanes, this model replicates "White 125," the F4U-1 Corsair flown by 5-victory ace 2nd Lt. Donald L. Balch of the VMF-221 "Fighting Falcons" when he downed a Japanese Zero (his first victory of World War II) on July 6, 1943. It features textured surfaces, a detailed cockpit with a glazed canopy, authentic markings, and more. 6" wingspan; includes a display stand that identifies the plane and pilot. This blonde beauty might just straighten out the wings of this F4U Corsair! 15"x 21" poster. a Vought F4U-1 Corsair (nicknamed for it birdcage-like canopy), this 1/72 scale, plastic kit features a well-equipped cockpit with the original's distinctive canopy, a detailed engine with a rotating propeller, realistic landing gear and an arrestor hook, and a choice of four U.S. Navy and Marine Corps markings (Maj. Greg "Pappy" Boyington of the VMF-214 "Black Sheep," Lt. Kenneth Walsh of VMF-124, and two VF-17 "Jolly Rogers" markings). 6" wingspan; assembly required. You've always wanted one… and now you can have it! With this electric, everything-included F4U Corsair, now is the time to step up to the thrills of radio controlled fighter aerobatics. 44" wingspan; minimal assembly required. This electric, ready-to-fly, radio-controlled F4U Corsair features realistic looks and spot-on flight characteristics with 4-channel control for the ultimate R/C experience. Like the original gull-wing fighter, it has plenty of performance for sport aerobatics (such as rolls and loops!) but remains a joy to fly at slower speeds if you want to throttle back and shoot touch-and-go landings! "White 29," Ira Kepford, VF-17 "Jolly Rogers"
This value d, 1/48 scale, die cast model of the F4U Corsair flown by 26-victory ace Maj. Greg "Pappy" Boyington - leader of VMF-214, the famed "Black Sheep" squadron - features textured surfaces, a clear plastic canopy, a rotating propeller, authentic markings, a Corsair collector's card, and more. 10" wingspan; includes a display stand. an F4U-1D Corsair flown by VMF-112, the "Wolf Pack," off the USS Bennington (CV-20) in April, 1945, this limited edition, 1/72 scale, die cast Corgi model features engraved panel lines; a detailed cockpit with a glazed canopy and a pilot figure; a rotating propeller; two removable external fuel tanks; optional position landing gear; authentic markings, including the Bennington's "Pine Tree" recognition symbol on the wings and tail; and more. 6" wingspan; includes a display stand. Maj. Gregory "Pappy" Boyington, VMF-214 "Black Sheep"
Hobby Master Mustangs, Spitfires, Fw 190s, and others in this series are widely recognized as the finest die cast WWII warbirds ever produced, and the line just keeps getting better and better. So don't wait. Order your highly collectible, "Bent Wing Bird" now! 10" wingspan. Made of Philippine mahogany, this hand carved, 1/40 scale model beautifully replicates the F4U-4 Corsair flown by the U.S. Marines' VMF-212 "Devil Cats" in the Korean War - right down to the centerline fuel tank and wing-mounted bombs! Measuring 10" long with a 12" wingspan, it includes a display stand with a mahogany base and a history plate. Take off with Cook Cleland, World War II ace who downed five enemy aircraft while flying a dive bomber and then went on to fly this Super Corsair in the Thompson Trophy races of the late 1940s. This 1/48 scale plastic kit features resin, photo-etched and film detail parts; optional vacu-form canopies; a choice of markings, including those flown to victory in the 1949 Tinnerman Trophy race; and more. 10" wingspan; assembly required. Plastic kit featuring fully engraved panel lines and rivet detail. Realistic cockpit interior includes a seat and controls. Optional bombs and external fuel cells included. 6¾" wingspan when completed. Powered by the Pratt & Whitney R-2800 radial engine, this late-war and post-World War 2 variant featured a "blown" canopy. Plastic kit includes a detailed cockpit, authentic engine with crankcase and a front row of cylinders, and a realistic wheel assembly. Ordnance includes wing-mounted rockets and fuselage mounted bombs. 83 pieces and a 9¼" wingspan when complete. Made of Philippine mahogany, this 1/32 scale model measures 12 ½" in length and has a wingspan of 15". Hand painted and detailed, model comes ready to display on the included mahogany base. This 1/48 scale plastic kit features recessed panel lines; a fully outfitted cockpit with a pilot figure; folding wings and a movable tail hook; retractable landing gear with working bay doors; a rotating propeller; drop tanks, bombs and wing-mounted rockets; a choice of two markings, including those of VMF-214, the "Black Sheep" squadron, from Korea in 1951; and more. 10" wingspan; 70 parts, assembly required. Plastic kit of the best-known WWII Naval fighter features recessed panel lines, a detailed Pratt & Whitney R-2800 engine with choice of propeller and open or closed cowl flaps, and choice of raised or lowered flaps. Includes rockets, drop tanks and bombs. Choice of markings includes those of Maj. Gregory "Pappy" Boyington. 133 pieces; 10" wingspan when complete. Lt. Edwin L. Olander, VMF-214 "Black Sheep"
A replica of "Marine's Dream," a Vought F4U Corsair flown by 5-victory ace 1st Lt. Edwin L. Olander of the U.S. Marine Corps' VMF-214 "Black Sheep" when it was stationed at the Solomon Islands in 1943, this 1/48 scale, die cast Hobby Master model features engraved panel and hatch lines and simulated fabric texturing on its wing and tail surfaces; a well-equipped cockpit with a sliding "birdcage" canopy; a detailed Pratt & Whitney R-2800-8 radial engine front with a rotating propeller; the prototype's famous inverted gull-wings, which can be repositioned for display in either the flying or folded configurations; machine gun ports, simulated navigation lights, a pitot tube, and other super-fine details; optional-position landing gear; and authentic markings, including the original's sultry nose art. 10" wingspan; arrives ready to display on the included stand. During World War II, the F4U Corsair ruled the skies over the Pacific and became a legend. Now, this limited edition, 1/18 scale, die cast metal 1932 Ford Coupe - a genuine tribute to that plane - features the Corsair's colors and the markings of its most famous squadron: the VF-17 "Jolly Rogers." This battle-hardened car even has bullet holes in the trunk deck, car tire "kill" emblems, and a license plate that reads "F4 - 32!" You also get a well-equipped interior with a detailed dashboard, working steering, aluminum "bomber-style" seats and opening doors; a glazed windshield; a detailed flathead Ford V8 "Ardun" engine (complete with spark plug wires, hoses, and fan blades) with a removable hood; plenty of simulated chrome; a detailed underframe, fuel tank, and exhaust system; an intricate suspension system with free-rolling wheels and realistically treaded tires; and much more. 8" long; arrives ready to display. Gary Velasco. Hand painted, authentic reproduction of the nose art of Maj. Gregory "Pappy" Boyington's F4U-1A Corsair. Panel is a scaled-down version of the real thing and is made of aluminum. Ready to display on the two attached D-ring hangers. 22"x 18". The 70+ laser-cut parts included in this kit makes it one of the finest quality balsa kits available. You get hand-selected balsa, color peel-and-stick decals, 5-inch plastic propeller, full scale plans with step-by-step instructions, light weight color tissue, wheels, rubber and more. 17?" wingspan when completed; assembly required. For display or rubber-powered flight. This amazingly detailed 1/48 scale plastic kit includes a full cockpit with a pilot figure, optional position wings, external rockets and drop tanks? even the Corsair's thick propeller blades realistically replicated. And if that weren't enough, you also get the "moto-tug" with driver, which towed U.S. fighters on aircraft carrier flight decks. 10" wingspan; assembly required. 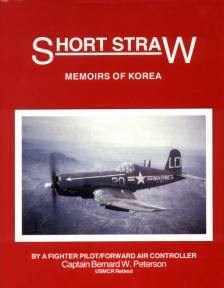 Look at the Short Straw Exhibit about the F4U Corsair from Captain Bernard Peterson. Cook Cleland, World War II ace who downed five enemy aircraft while flying a dive bomber and then went on to fly this Super Corsair in the Thompson Trophy races of the late 1940s. "White 125," the F4U-1 Corsair flown by 5-victory ace 2nd Lt. Donald L. Balch of the VMF-221 "Fighting Falcons" when he downed a Japanese Zero (his first victory of World War II) on July 6, 1943. The F4U flown by Medal of Honor recipient Lt. (jg) Thomas Hudner, who intentionally crash-landed in an attempt to save his wingman, Jesse Brown, the U.S. Navy's first African-American aviator, in 1950 Korea. F4U flown by Medal of Honor recipient Lt. (jg) Thomas Hudner, who intentionally crash-landed in an attempt to save his wingman, Jesse Brown, the U.S. Navy's first African-American aviator, in 1950 Korea. two of the aircraft which helped shape the bitter fighting that took place over Guadalcanal in 1942. White 20 was an F4U-1 Corsair piloted by First Lt. Foy R. "Poncho" Garison of VMF-213. Ens. Saburo Saito flew with the Zuikaku Fighter Squadron that was involved in the evacuation of Guadalcanal before being based at Rabaul and Buin. American War Eagles: F4U Corsair: Thunder from the Skies. The Corsair is regarded as one of the greatest warplanes in history. Designed to fly behind the most powerful engine and biggest propeller of any fighter in existence, the prototype was the first U.S. combat aircraft to exceed 400 mph. Once the U.S. Navy adopted the Corsair as a ship-board fighter-bomber, they operated in the Pacific Fleet and established a kill ratio of 11:1 against Japanese aircraft. The Vought F4U Corsair carried out 64,051 missions, during which 2,140 enemy aircraft were destroyed in combat with only 189 Corsair losses - an incredible success ratio of 11:1. Designed to fly behind the most powerful engine and biggest propeller of any fighter in existence, the prototype was the first U.S. combat aircraft to exceed 400 mph. Once the U.S. Navy adopted the Corsair as a ship-board fighter-bomber, they operated in the Pacific Fleet and established a kill ratio of 11:1 against Japanese aircraft. Diamondback rattlesnake of VMF-323 - the Death Rattlers! Flying his F4U-5N Corsair, Lt. Guy Bordelon shoots down the first of two Soviet-built La-11s he defeated in a matter of minutes south of Seoul, Korea, on June 30, 1953. Captain Peterson flew in both WW2 and the Korean War in the Corsairs. Before becoming a pilot and an officer, he was a seaman on a ship that was sunk by the Japanese. He came back to the states and heard about flight school. He applied for the school and then became an officer and a flew these great aircraft. I have spoken to Captain Peterson several times and he is a real nice person. He told me the story of his friend who flew in the corsairs in WW2, the Korean War, then flew another plane in the Viet Nam War. The book really is fantastic with great pictures and great stories. Please note that the specs here are for only one version of the F4U Corsair, other versions have different specifications.